Self-driving cars are very new, and like all other technologies, the law always comes after it. 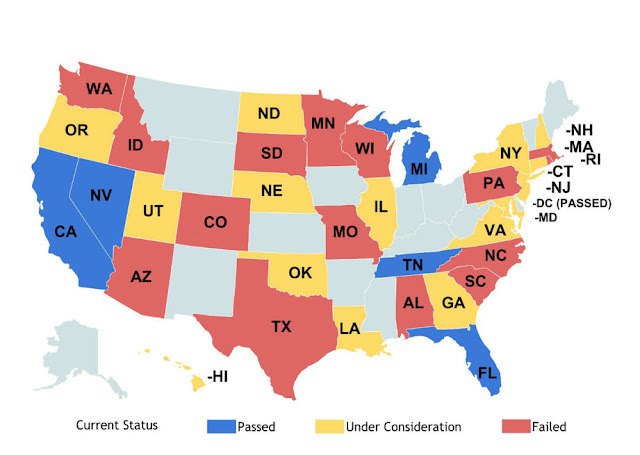 As we can see in the picture above, there are just a few states in USA created and approved the law for self-driving cars, so many other states are still developing it and even some of them were failed to approve the law, also a a lot of states are not even considering for making the law for the self-driving cars. So it will need a very long time until all the states conduct and announcing a completed law for the autonomous vehicles. So, allowing the self-driving cars to travel around the world now is significantly dangerous, especially for human life. When there is an accident happened, it would be very hard to determine who will take the responsibility for it, every harder on the countries that haven't provided the law for self-driving cars yet. Next, without a full set of law, there will be no clear standards for the manufacturers to make the new autonomous cars. They will have to provide their own standards that they believed is right. That could be a potential risk, because maybe the standards are not well tested and can be dangerous when being adopted to the new cars. Because the self-driving cars can affect so many aspects of life, the law has to determine the standards, not the manufacturers. The next problem in my opinion is about the cyber security. The lacking of clear documents for the restricted areas for self-driving cars is a highly risky problem. If someone hacked the system of an autonomous car and was granted full access to the system, he can use it to go to some restricted areas and can cause a lot of damage. Also, when the hacker uses the cars to cause the criminal actions, the law has to clearly points out the one who will take responsibility for that. So the future of autonomous cars is bright, they can be a better solution for transportation but it will take awhile before the law is fully documented.